I was raised a reform Jew, and even though I am not and have never been religious, I still identify culturally with my ancestors (on my father’s side—on my mom’s side, I’m straight Irish-Catholic—so I guess you could call me something of an expert on guilt). The topic of Jerusalem has always been a touchy subject, and I experienced a generational divide everywhere I went throughout my youth. Which brings us to Israel—one of the most divisive issues that I have experienced throughout my entire life. I am both extremely critical and defensive of the Jewish state, and this problem stems from the fact that it is quite difficult for Jews to divorce Israel’s theoretical existence from its practical one. Whenever I hear people deride Israel, there is a part of me that reflexively defends this apartheid state without thinking. For centuries, Jews have been the victims of various apartheid states, and the establishment of Israel was supposed to be our light at the end of the tunnel. It is, but so is New York City (Israel and the United States account for around 88% of Earth’s roughly 15 million Jews). We didn’t see that one coming, and the Jewish people’s double-salvation in the American empire is now inextricably linked to its proxy-state occupying a plot of land pledged to us by the Bible. The problem is that we cannot defend Israel solely on theoretical terms. It’s a fact that for all of its accomplishments, Israel is still by definition, an apartheid state. We typically hear that term in the South African context, but it describes any country that separates people according to color, ethnicity, caste, etc…Palestinians live in Israel, but they are subject to being (at least) moved out of their homes at the whim of the Israeli government. By all functional accounts, Palestinians are second-class citizens under the Israeli government, and any Jew inspired by our people’s nomadic history who does not sympathize with the Palestinians is actively avoiding the lessons from our own teachings (I mean, the Palestinians are literally wandering through the desert thanks to an oppressive ruler—come on). Yes, Iran has proxies set up around and within Palestine, which wage near-perpetual war on the Jewish state. But Israel’s response has been to wage near-perpetual war against the Palestinian population, all in the name of profit and a proxy war between the United States, Saudi Arabia and Iran. This isn’t the Jewish people’s fight. It’s another battle in the eternal war that is empire. 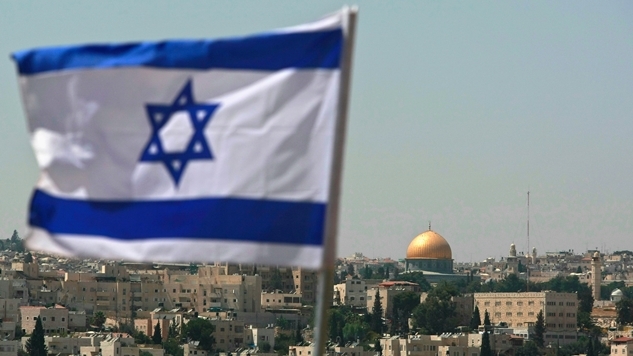 Jerusalem is the capital of the Jewish people. And the Palestinians. And Christians. Jerusalem is basically one of the centrifuges of modern humanity. It is impossible to tell the story of nearly any major religion without traveling through the de facto capital of countless ancient peoples. Jerusalem is everyone’s and no one’s to own. What the United States and Israel have done is drawn modern borders around an ancient dispute, trapping countless innocents in the process. Borders are drawn by imperialists like the Ming dynasty, or the British empire or Amazon. If you want to understand why the Middle East is so screwed up, the Sykes-Picot agreement is a perfect example. In 1916, England and France drew up a secret pact to divide territory spanning from the Mediterranean Sea to Turkey, committed standard colonial atrocities, and then they bolted as soon as things went haywire. The United States stepped in to the vacuum, because if no one’s propping up dictators and staging coups (like the one in Iran that the CIA admitted to doing), then why even bother having an empire? What else is it supposed to do? Take care of its people and plant seeds for future generations to improve upon our progress? That’s crazy talk. The across-the-board failures of the American government over the past half-century is imbued into Israel, and what makes this conversation uncomfortable with my political allies is that too many liberals don’t take the time to separate the two. There are plenty of Jews who despise the Netanyahu government, and call his (and his predecessors) occupation of Palestine a moral stain on our culture. But where the left loses people like me is implying that the Israeli people are complicit in the crimes of the Israeli government (some certainly are, but show me a country that doesn’t have destructive bigots). Highlighting abuses in these occupied areas as representative of the general population genuinely gets under my skin because it feels anti-Semitic, even if that’s not your intent. Most Israelis want a two-state solution just as much the left does—fifty-nine percent according to a poll conducted by the Palestinian Center for Polling and Survey Research (PCPSR) and the Israel Democracy Institute (IDI). This is more a problem of empire than popular will. Israel is supposed to be a promise from my ancestors made good on by my forefathers. Instead, it’s a political football, and I’m sick of it. Trump declaring Jerusalem to be the capital of the Israeli state may satisfy some hard-line Jews, but I’ve got news for you: most of us already think that it is our capital, and it really doesn’t matter where the American government puts its embassy (which is why it’s so stupid to move it to Jerusalem and invite a wave of violence on both countries). In fact, we understand that our extreme bias makes it alright for Palestinians to think that Jerusalem is solely their capital too. This is a problem that has never had a universally-acceptable solution, and many of us have made our peace with the fact that there will forever be a divide. Unfortunately, bad actors have always weaponized that divide, and turned it from theoretical to tangible. Two of those present-day bad actors are governments effectively representing the Jewish people on this planet, but that doesn’t mean that we endorse this apartheid policy fraudulently established in our name.